Wind and solar are parasitic power producers, unable to survive in a modern electricity grid without the back-up of stand-alone electricity generators such as hydro, coal, gas or nuclear. And like all parasites, they weaken their hosts, causing increased operating and transmission costs and reduced profits for all participants in the grid. Without subsidies, few large wind/solar plants would be built; and without mandated targets, few would get connected to the grid. Green zealots posing as energy engineers should be free to play with their green energy toys at their own expense, on their own properties, but the rest of us should not be saddled with their costs and unreliability. We should stop promoting parasitic power producers. As a first step, all green energy subsidies and targets should be abolished. Blowing Our Dollars in the Wind. 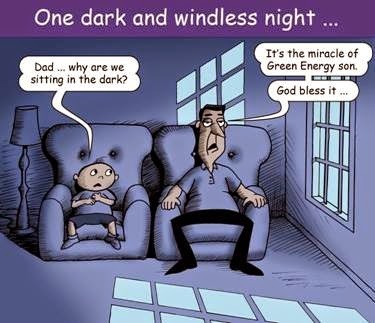 Wind energy produces costly, intermittent, unpredictable electricity. But Government subsidies and mandates have encouraged a massive gamble on wind investments in Australia - over $7 billion has already been spent and another $30 billion is proposed. This expenditure is justified by the claim that by using wind energy there will be less carbon dioxide emitted to the atmosphere which will help to prevent dangerous global warming. Incredibly, this claim is not supported by any credible cost-benefit analysis - a searching enquiry is well overdue. Here is a summary of things that should be included in the enquiry. Firstly, no one knows how much global warming is related to carbon dioxide and how much is due to natural variability. However, the historical record shows that carbon dioxide is not the most important factor, and no one knows whether net climate feedbacks are positive or negative. In many ways, the biosphere and humanity would benefit from more warmth, more carbon dioxide and more moisture in the atmosphere. However, let’s assume that reducing man’s production of carbon dioxide is a sensible goal and consider whether wind power is likely to achieve it. To do this we need to look at the whole life cycle of a wind tower. Wind turbines are not just big simple windmills – they are massive complex machines whose manufacture and construction consume much energy and many expensive materials. These include steel for the tower, concrete for the footings, fibre glass for the nacelle, rare metals for the electro-magnets, steel and copper for the machinery, high quality lubricating oils for the gears, fibre glass or aluminium for the blades, titanium and other materials for weather-proof paints, copper, aluminium and steel for the transmission lines and support towers, and gravel for the access roads. There is a long production chain for each of these materials. Mining and mineral extraction rely on diesel power for mobile equipment and electrical power for haulage, hoisting, crushing, grinding, milling, smelting, refining. These processes need 24/7 reliable electric power which, in Australia, is most likely to come from coal. These raw materials then have to be transported to many specialised manufacturing plants, again using large quantities of energy, generating more carbon dioxide. Then comes the construction phase, starting with building a network of access roads, clearance of transmission routes, and excavation of the massive footings for the towers. Have a look here at the massive amount of steel, concrete and energy consumed in constructing the foundations for just one tower. Not one tonne of steel or concrete can be produced without releasing carbon dioxide in the process. Almost all of the energy used during construction will come from diesel fuel, with increased production of carbon dioxide. Moreover, every bit of land cleared results in the production of carbon dioxide as the plant material dozed out of the way rots or is burnt, and the exposed soil loses its humus to oxidation. Once the turbine starts operating the many towers, transmission lines and access roads need more maintenance and repair than a traditional power plant that produces concentrated energy from one small plot of land using a small number of huge, well-tested, well protected machines. Turbines usually operate in windy, exposed, isolated locations. Blades need to be cleaned using large specialised cranes; towers and machinery need regular inspection and maintenance; and mobile equipment and manpower needs to be on standby for lightning strikes, fires or accidents. All of these activities require diesel powered equipment which produces more carbon dioxide. Even when they do produce energy, wind towers often produce it at times when demand is low - at night for example. There is no benefit in this unwanted production, but it is usually counted as saving carbon fuels. Every wind farm also needs backup power to cover the 65%-plus of wind generating capacity that is lost because the wind is not blowing, or blowing such a gale that the turbines have to shut down. In Australia, most backup is provided by coal or gas plants which are forced to operate intermittently to offset the erratic winds. Coal plants and many gas plants cannot switch on and off quickly but must maintain steam pressure and “spinning reserve” in order to swing in quickly when the fickle wind drops. This causes grid instability and increases the carbon dioxide produced per unit of electricity. This waste should be debited to the wind farm that caused it. Wind turbines also consume energy from the grid when they are idle - for lubrication, heating, cooling, lights, metering, hydraulic brakes, energising the electro-magnets, even to keep the blades turning lazily (to prevent warping) and to maintain line voltage when there is no wind. A one-month study of the Wonthaggi wind farm in Australia found that the facility consumed more electricity than it produced for 16% of the period studied. A detailed study in USA showed that 8.3% of total wind energy produced was consumed by the towers themselves. This is not usually counted in the carbon equation. The service life of wind towers is far shorter than traditional power plants. Already many European wind farms have reached the end of their life and contractors are now gearing up for a new boom in the wind farm demolition and scrap removal business. This phase is likely to pose dangers for the environment and require much diesel powered equipment producing yet more carbon dioxide. Most estimates of carbon dioxide “saved” by using wind power look solely at the carbon dioxide that would be produced by a coal-fired station producing the rated capacity of the wind turbine. They generally ignore all the other ways in which wind power increases carbon energy usage, and they ignore the fact that wind farms seldom produce name-plate capacity. When all the above factors are taken into account over the life of the wind turbine, only a very few turbines in good wind locations are likely to save any carbon dioxide. Most will be either break-even or carbon-negative - the massive investment in wind may achieve zero climate “benefits” at great cost. Entrepreneurs or consumers who choose wind power should be free to do so but taxpayers and electricity consumers should not be forced to subsidise their choices for questionable reasons. People who claim climate sainthood for wind energy should be required to prove this by detailed life-of-project analysis before getting legislative support and subsidies. Otherwise we are just blowing our dollars in the wind. Five Fatal Flaws of Solar Energy. PV solar panels can directly harvest solar energy. They are useful in remote locations, for some portable applications and, with enough panels and batteries, stand-alone solar can even power homes. Secondly, to be a stand-alone energy supplier, PV solar needs batteries to cover those times when solar is not producing - about 75% of the time under ideal cloudless skies. To charge the batteries for continuous power, while also supplying usable power, a solar plant can only deliver a theoretical maximum of 25% of its day-time capacity. The chance of cloudy days will greatly increase the battery storage needed, and the generating capacity absorbed in charging the batteries. Currently, only pumped hydro storage could possibly supply the storage capacity needed and then only at massive cost, and in a few suitable locations. In the real rotating world, where sunshine only reaches usable intensity for about 25% of the time, the best located panel would have a capacity factor of about 17% - it would receive 170 watts of energy – not quite 2 X 100W light bulbs. It is sensible to use unused space like roofs for solar collectors but such fragmented facilities will never match a compact well-designed solar plant in construction, maintenance and cleaning costs or go close to achieving the correct panel orientation. Most people underestimate the land needed for significant solar collectors. In a learned paper published in 2013, Graham Palmer has produced a credible calculation that it would need a square with 31 km sides, completely filled with PV panels, to collect energy equivalent to Australia’s annual electricity requirements. In addition, PV panels start to degrade in rain, hail and sunshine from the day they are installed, some panels losing significant capacity in as little as three years. And unless washed regularly, dust and bird poop degrades their performance even quicker. All those sparkies checking panel performance and all those cleaners need access roads – this greatly increases the area needed for industrial solar installations. Fifthly, large-scale solar power will create environmental damage over large areas of land. Solar collectors may only manage to convert about 10% of the sun’s energy into electricity, the rest being reflected or converted into local heating. But the whole solar spectrum is blocked, thus robbing 100% of the life-giving sunshine from the ground underneath, creating a man-made solar desert. For solar-thermal, where mirrors focus intense solar heat to generate steam, birds that fly through the heat beams get fried. Why would true environmentalists support industrial-scale solar energy collection? All consumers should be free to use solar energy in their own way at their own cost. But these five fatal flaws mean that collecting solar energy should never play more than a minor and very expensive role in supplying grid power. Household Solar Photovoltaics – supplier of marginal abatement or Primary Source of Low Emission Power? Disclosure: Viv Forbes has a degree in applied science and long experience in the resource, energy and investment industries at senior levels. He is Chairman of the Carbon Sense Coalition and a non-executive director and small shareholder in a small Australian coal explorer. He has a vested interest in having access to reliable economical electricity supplies. Known as The Sensible Environmentalist, Dr Patrick Moore has been a leader in the environmental movement for more than 40 years. He is a co-founder of Greenpeace where he served as the Canadian President for nine years and as a Director of Greenpeace International for six years. Dr Moore has accepted an invitation from The Galileo Movement to visit Australia later this year. We recently sent a letter to our mail-list seeking support and feedback. It was titled “How to Combat the Mania of our Times”. An unusual number of emails were rejected with this warning: “Message filtered”. So if you did not get it, please let us know, and please tell your spam checker we are an allowed sender. Corporate IT systems seem to erect the biggest barriers. Despite that hiccup, we got a huge supportive response. Apologies to all those people we have not yet answered. We do read everything, but sometimes cannot answer everything. A few generous people also sent subscriptions – big thanks there too. A few asked to “Unsubscribe”, and for once we got no abuse! And we got offers to help edit things. 1. Hi Viv, your carbon sense is brilliant n wonderful and accurate. What you n all these are doing; thank you; and again, intelligent truth in your letters to the local papers. When you n me meet, I'll bring my bathroom scales; you're worth your weight in gold. 2. Keep on going. Lately I have been keenly reading your articles in our local paper, and the responses your articles receive. It infuriates and bemuses me at the same time, at the hype, lies and naivety of some people. We are not in a financial position to help and are limited in knowledge of how to use facebook, etc. But I read and forward these emails to others in our reach. I always appreciate receiving your email updates. Your work is very important and I’m sure it has influenced Tony Abbott and others in decision making roles. After all, Australia has probably the only western government to have reversed and rid themselves of a carbon tax...This alone is a huge accomplishment that we must aspire to, an example that undoubtedly will be used to convince others from the same misadventure. We here in the province of British Columbia, Canada have a Carbon Tax (CT) that with a population of only 4.5 million is siphoning approx 1.1 $billion annually from our pockets. During the latest election of May 2013 the debate to repeal the CT was...how could we replace over a $billion in tax revenue from other sources? The answer from the Liberals who enacted it approx 5 yrs ago (in power since 2001) is that we couldn’t afford to get rid of it. Since, it has become accepted as the norm, and now other municipal and regional Public Transit authorities want the CT increased so they can take a bigger share rather than upping our property taxes or upping the separate fuel surcharge gas tax etc., you know the game they play. I write many letters to the editors and circulate some of them to 85 editors around our province. I learn from many of the sources you listed, have been following you for 6-7 years and especially enjoy your work as you have a nice simplified educational and impactful storytelling way of explaining the topics. The attacks from the left give many of us skeptics more resolve which reminds me of Johnny Cash’s song “I won’t back down”. Keep hammering away at them as progress may be slow but I can see subtle changes in a lot of editors’ attitude. No, it is “V Vattsupwiththat”. Par for the course from them.